A Fairfield Prep education is a mission driven and hands-on educational experience which challenges young men to become open to growth, intellectually competent, religious, loving, and committed to doing justice. Prep students are challenged in the classroom, on the stage, on the athletic field, and through community service to become reflective young men, able to discern their way through challenges and become positive contributors to our global society. In short, a Fairfield Prep education prepares a student for success in the classroom and in life. Are you ready to PREP for Life? We welcome you to contact the Admissions Office if you have any questions about the Prep application process. A bond that forms at Prep and lasts well beyond the four years of a Prep education. A Prep education encompasses more than just learning in a classroom. 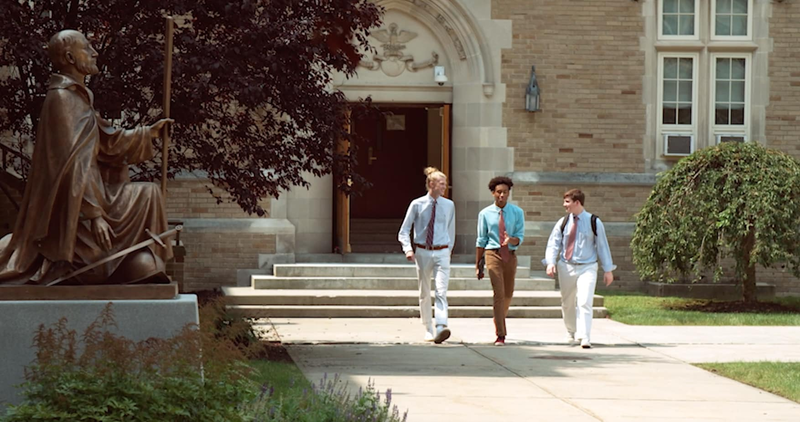 At Prep, we use the term cura personalis, the "education of the whole person." Prep students are taught how to exercise empathy in every day situations, to engage those with differing viewpoints and to challenge themselves in being young men of conscience. Prep celebrates its diversity. More than a quarter of the boys who attend Prep identify as students of color, and we welcome students from more than 50 towns throughout the area. We also have students coming from varying economic backgrounds, and we supplement tuition with $2.7 million in financial aid. No student should decline applying to Fairfield Prep due the cost of tuition. Prep gives out $2.7 million in financial aid, and one in three Prep students receives aid. For 75 years, thousands of boys have been transformed through their Prep education. And while our graduates are high achievers in terms of college acceptances, artistic performances, and athletic awards, our true mark of excellence is the proven quality of their leadership in society. - President Rev. Thomas M. Simisky, S.J.